Glowing skin and shiny hair aren’t reserved exclusively for “the lucky ones” with good genes. And they don’t require a bottomless budget for purchasing exorbitantly priced designer beauty products. In fact, the opposite is true. Apricot kernel oil is an incredible natural beauty resource that could help you achieve that highly sought-after gorgeous hair and skin for just a few dollars. Originally found in Asia, apricots have been cultivated for many centuries. In medieval times, the fruits were used to treat tumors and ulcers. Nowadays, both the fruits and their stones are used for multiple benefits. Apricot kernels contain between 40 and 60 percent oil. The oil has a pale yellow color and a light, nutty scent and flavor. The nutrient content of the oil includes vitamin A, vitamin B17, vitamin C, and vitamin E. Both linoleic and oleic fatty acids are found in apricot oil, but the latter is more prevalent (about 65 percent). Cosmetics research has found that oils higher in oleic acid, like apricot kernel oil, are better for those who do not have acne-prone skin. Those struggling with acne should use oils higher in linoleic acid, such as hemp seed oil, evening primrose oil, or grape seed oil. Apricot kernel oil absorbs into the skin very well and has a light feel, so it makes a great after-shower moisturizer. This is especially useful for people who tend to get dry, itchy skin after a shower. Try smoothing a small amount over the skin while it is still damp. This seals in the moisture from the water. 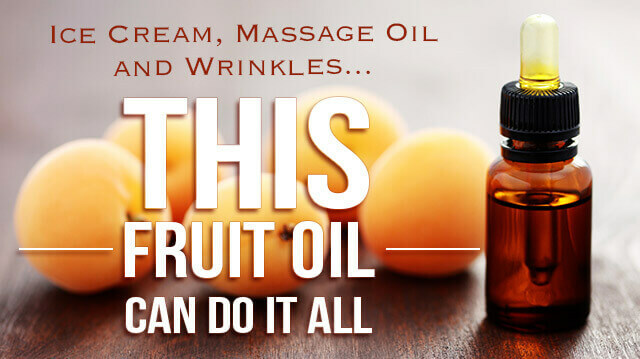 Similarly, apricot kernel oil makes a great face wash and moisturizer with anti-aging effects. The vitamins A and C found in apricot oil are potent antioxidants. They can help to reverse the damage done to skin cells on a daily basis and assist in slowing the signs of aging. The vitamin E helps to promote regeneration, which can hide lines and scars. Apricot oil is said to strengthen the skin around the eyes, reducing puffiness and fine lines. Try oil cleansing with apricot oil on a daily basis, or using it in lieu of a commercial eye cream. The nutrient content of apricot kernel oil makes it a great antiseptic. Use as an ingredient in a homemade first-aid salve to reduce the risk of infection in small scrapes and cuts. For those with painful or itchy skin conditions, apricot kernel oil can be helpful. It is great for sensitive skin and feels very soothing. Conditions such as eczema, psoriasis and rosacea can benefit from a light application of apricot oil, which maintains a protective layer of moisture for a long period of time. Apricot kernel oil is an emollient, a sealant and a humectant. All of these properties are helpful for hair. The emollient property means that the oil absorbs well into the hair, providing nourishment to hair strands. It also seals the follicle making for stronger, shinier hair. The humectant property means the oil can attract moisture into the hair to control dryness. Try a nourishing scalp massage with a little bit of warmed apricot kernel oil to promote hair growth and a healthy scalp. Massage for 15 to 20 minutes and leave the oil on the head overnight for best results. Some also recommend using apricot kernel oil as a pre-shampoo treatment to protect the hair from becoming too dry. As mentioned above, skin conditions can benefit from the use of apricot kernel oil. This concept can possibly be extended to the prevention or treatment of skin cancer, thanks to the antioxidants and vitamin B17 found in the oil. Some apricot oils are made for internal consumption (check the label), in which case they can be beneficial for heart health. Animal studies have found that apricot kernel oil can prevent heart attacks — research has not yet been done on humans. Apricot kernel oil makes a great carrier for essential oils. With its light texture and minimal scent, it pairs great with all essential oils. Since it absorbs so well into the skin, it is a popular choice for massage. Food-grade apricot oil has a nutty taste similar to almonds, so it works great as an ingredient in homemade baked goods and desserts, such as ice cream, cookies or marzipan. Apricot kernel oil can be used for cooking or in oil-based foods like salad dressings. Try adding some to homemade pesto or hummus for a nutty flavor. Be sure to find a brand that is intended for internal consumption (and not just cosmetic use). Apricot kernel oil is a good choice for DIY soap-making, and can be combined with oils such as coconut, palm or olive oil. Try making your own foot scrub with apricot kernel oil. Simply blend a tablespoon of the oil with one-third of a cup of coconut sugar. Optionally add rosemary or ginger essential oil for a dose of antioxidants. Soak the feet for a few minutes in warm water, then scrub well with the mixture. Rinse off and pat dry. Apricot kernel oil is so gentle on skin that it is a good option for babies and young children. Try substituting conventional diaper creams and skin ointments with vitamin-rich apricot oil. As with most natural oils, it’s important to seek out an organic, unrefined, cold-pressed product. Organic is important because many of the chemical fertilizers, herbicides and pesticides used on mainstream produce are fat-soluble, and thus end up dissolved in the oil. In order to meet purity requirements, the oil must then undergo industrial refinement to eliminate the toxins. It is therefore better to invest in an organic oil in the first place. Unrefined or virgin oils are made using a simple process of pressing the fruit. This process does not require any chemical refinement, additives or solvents. This is the safest choice for oils that are used directly on the skin. Finally, cold-pressed indicates that high heat was not used during the extraction of the oil. This is beneficial because heat destroys many of the delicate compounds found in the oil, such as vitamins and fatty acids. Cold-pressed therefore gives you the best bang for your buck. Looking for natural beauty and anti-aging solutions? Learn more about fighting wrinkles with raw honey!